Bob Marley's NZ film cameo: How did they do that? How did they get Bob Marley to make a cameo appearance in local movie Mt Zion? Lydia Jenkin reports. 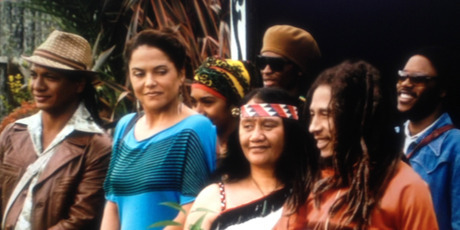 A still from documentary Come a Long Way showing Bob Marley receiving a powhiri at Parnell Rose Gardens in 1979 appeared in Mt Zion using a technique known as rotoscoping. Before local award-winning film Mt Zion was released back in February, we didn't want to give too much away about the film's famous special guest. But now the film has had a successful cinematic run (taking $1.6 million at the box office across Australia and New Zealand), and is being released on DVD, it's safe enough to talk about the rather astounding appearance of Bob Marley at the end of the film. Of course, Marley's involvement in the storyline isn't surprising, given that Mt Ziontells the tale of a group of young Pukekohe potato farmers vying for a chance to open for Marley and the Wailers at Western Springs in 1979. But what does generally draw a gasp from audiences, is that Marley appears in the film for real. Yes, tragically he died in 1981, but thanks to archival documentary footage, and the marvels of technology, Marley magically turns up at Nga Hau E Wha Marae in Pukekohe, to receive a powhiri at the end of the film. As director Tearepa Kahi explains, discovering the archival footage of Marley was actually what inspired him to write and make the film in the first place. "I was doing some directing at TVNZ, and would shoot up to the archives at lunchtime, and watch old footage. I couldn't believe what I was seeing on the VHS - this was in the days before it was on YouTube, and honestly I was just so mesmerised, because there was Bob Marley, receiving this powhiri, this Maori welcome, and the beautiful wero [the opening challenge]. "And so it started when I went, 'Wow, imagine what it would've been like to be the person who did the wero to Bob Marley', and then I realised, wait a minute, that's actually quite a good question, and that was the genesis point." The original footage comes from a documentary called Come a Long Way, fronted by iconic local journalist Dylan Taite, and made for TVNZ. It features footage of Marley receiving the powhiri in the Parnell Rose Gardens, along with the now legendary interview which Taite did with Bob Marley, and a great clip of them all playing soccer together. But merging that old footage into the new film was not a simple cut-and-paste job - Marley does truly seem to be led on to the marae by the film characters, and to accept the offering given by Turei, played by Stan Walker. In order to make it seem as real as possible, Kahi and his team used a technique known as rotoscoping. "So we had the original footage, we set up the same frame size, so the footage can be matched up, and then you basically shoot a plate - you shoot the same sequence without Bob, but with the same timing, and then you transpose the real footage on top of the new footage, and hope and pray like crazy that it matches. "We spent weeks calibrating colour, re-building and strengthening the original image, readjusting the scale and composition, getting actors to trust their imagination, but it all means nothing if you don't have any emotional weight to carry the moment. And that's the essential ingredient of all good SFX shots. So shout out to the Lion." The technical aspect wasn't the only obstacle to overcome though - getting permission to have Marley "appear" in the film took a great effort also. "I think we spent four or five years knocking on the door of the Bob Marley family estate, and then, probably four days before the end of our shoot, through grace, and a friend of a friend, the lawyer from the Bob Marley estate signed off on it. So we had the blessing of Bob Marley's family to use the footage," Kahi says, with a sense of relief. "I remember the moment so clearly, even in the chaos of a film shoot. Throughout the shoot, you're fielding questions from all sorts of people, but in your mind, all that's going on is: are we going to be able to make movie magic here? Are we going to be able to bring Bob Marley, the Lion, to Pukekohe?" It sounds like it was meant to be though, because there was more than one co-incidental match up between historical events and the film. One of the surviving members of the kapa haka group who performed for Marley in 1979 was in the powhiri scene in the film; the father of one of Kahi's old co-workers was actually the young man who performed the wero in 1979, and Kevin Kaukau, the guitar genius who plays Booker in the film, was a member of the band Golden Harvest who really did open for Bob Marley at Western Springs. But getting Marley in the film was obviously the final triumph for Kahi. "It was like the Hillary Step of Mt Zion, right at the end. "You know we had a good film with a good story and cool music, but getting that sequence right was the Hillary Step," he laughs. What: Mt Zion on DVD, out now.